Once a month the PHE Canada Research Council selects one of its members to profile as Researcher of the Month. Whether it’s a university level teacher, academic, or graduate student, whoever is advancing research centered on topics and issues in physical and health education the Council wants to highlight. Do you know a PHE Canada Research Council member who’s professional ideals & service strengthens the physical and health education sector? Whose research & writing drives change forward? Who’s commitment and dedication to the field? 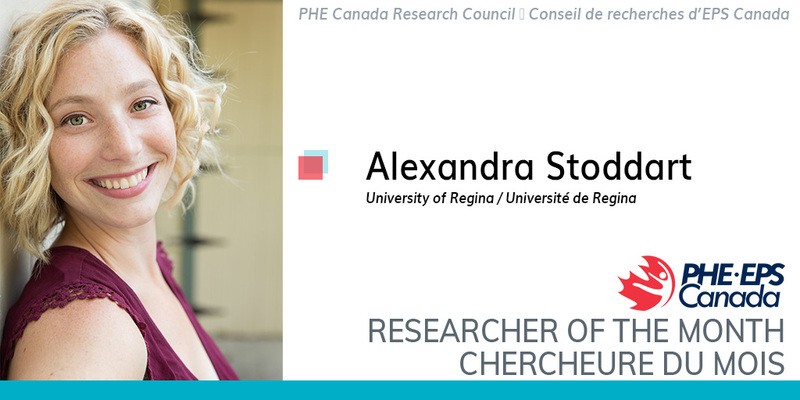 Dr. Alexandra Stoddart is an Assistant Professor in the Health, Outdoor and Physical Education (HOPE) subject area in the Faculty of Education at the University of Regina. 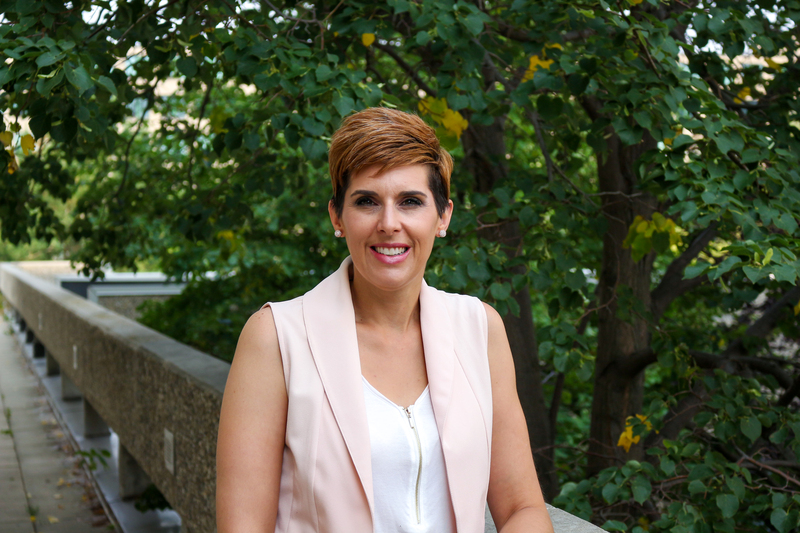 Before joining the U of R as a faculty member in January 2018, she completed her Ph.D. in Kinesiology at the University of Saskatchewan. Alexandra currently teaches HOPE undergraduate courses in both the Elementary and Secondary programs. She enjoys the opportunity to see her students learn, grow, and thrive as they engage in their pre-internship and internship experiences. How does one go from a struggling student in math and sciences to an award winning STEM (Science, Technology, Engineering, Math) teacher? For Carla Cooper it took finding her way past failures and obstacles and learning to teach outside of the box. 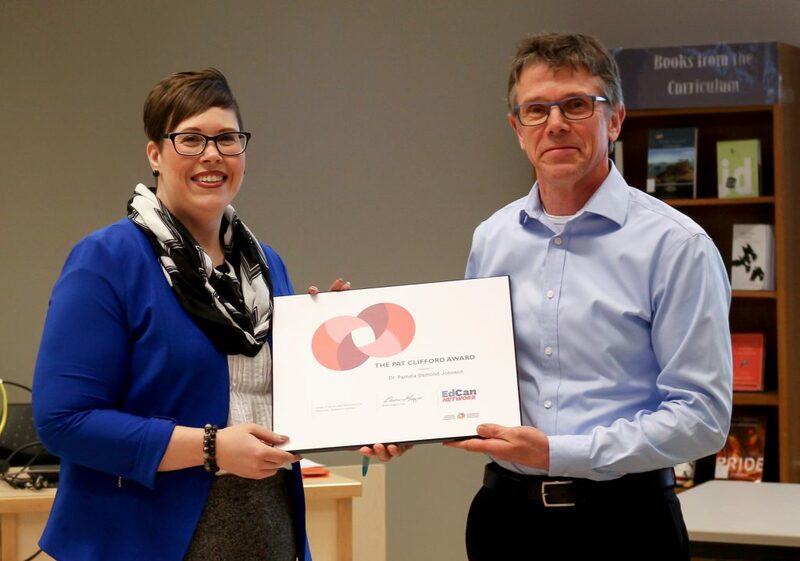 In May, Carla Cooper (BEd ’08), a teacher at Lumsden High School and graduate student doing her Master’s in Education at the University of Regina, was informed that she was a recipient of the prestigious Prime Minister’s Award for Teaching Excellence in STEM. 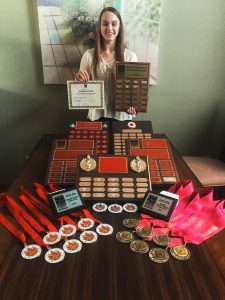 Cooper, who grew up in Moose Jaw, went back to school for a semester after graduating from high school to improve her marks. “I knew I wanted to do something in the sciences but I struggled in the sciences and math, quite badly. Fifties weren’t going to be good enough for me, so I spent a semester at Vanier, thinking a change might help. It was a huge help.” The change, or possibly a new maturity, Carla speculates, gave her success at Vanier, and from there, she went to Red Deer College to become a geneticist. However, life got in the way and before she finished, Cooper left college, moved home, got married, and began her family. Not long after, Carla started in a new career direction: She had always been drawn to teaching. “I was that kid who had a chalkboard in my bedroom. I was always pretending, playing school. I love being in school: the atmosphere, being around the staff and students, the smell of the school; it’s weird. I love the sounds, the feel, the buzz.” Cooper was working as an Educational Assistant when Dr. Sandy Kitz observed her teaching math. Carla says, “Afterwards she pulled me into her office. I thought I was in a lot of trouble, but Dr. Kitz said, ‘What are you doing here? You need to go back to school. You need to spread your wings and fly.’ That was the push,” says Cooper. The next step in 2001, was to enroll part-time in Science, while waiting for admission to the Faculty Education at the University of Regina. Cooper took the required sciences for the Science Education program and in 2004, she was accepted to the Education program, in which she chose a double major in biology and chemistry, and moved to full-time studies. Because this wasn’t a Grade 12 course, the final assessment was not a test. Instead, students were asked, “Did their patient live or die? How did they treat? Was their treatment ethical? Did they do invasive or non-invasive? What secretions did they evaluate, and why? What was the chemistry breakdown of that? And, how did the physics work for the cat scan? They had to do a peer review and self-review.” Carla created a rubric to go with the project and students marked themselves on the rubric. “These simulations have helped students either enter a science-oriented career, or decide against it. It has also helped prepare them for their post-secondary classes,” says Carla. When she first received the news in May that she was a recipient of the Prime Minister’s Award for Excellence in Teaching STEM, Carla wasn’t sure if the letter was for real. She sent it to her husband, asking, “Am I reading this right?” When she finally processed what was happening, she felt humbled and thought, “What makes me different? I am no different than any other teacher. 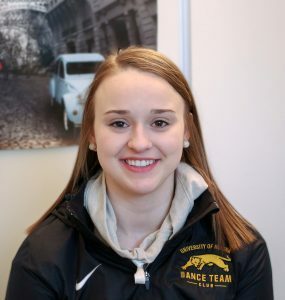 But I’m just realizing that I do things a bit different.” Carla is excited, by the new connections and opportunities to pass on her curricular understandings to others, including preservice teachers, generated by this recognition. 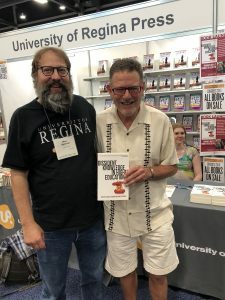 As a journalist, educator, political advisor, mentor, author, and lifelong learner, Allan Bonner has tackled some of the most controversial and public issues of our time. 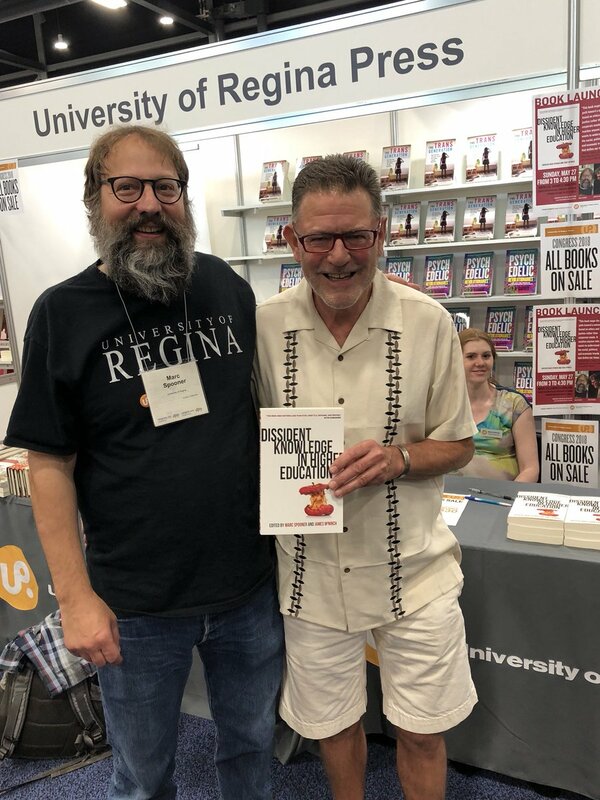 Allan began as a journalist locally and then nationally in Canada and the US, and now holds graduate degrees in political science, education, business administration, law and urban planning. Amy (Mickleborough) Moroz and Andrea (Gottselig) Ward are best known as award-winning athletes in the U of R Cougar Womens’ Basketball program. Both graduated with education degrees and now work in Regina schools as teachers and coaches – lending their skills to the next generation of young basketball players. of Regina alumni, they delivered events and hospitality to eight teams from across Canada. The 2018 Cougar Women’s Basketball team captured the bronze and the championship weekend was among the most successful U Sports tournaments in the University of Regina’s history. 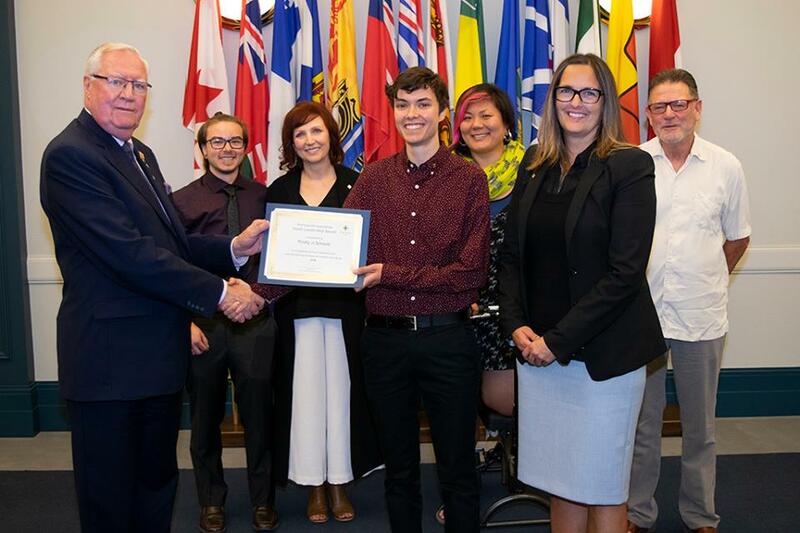 The Lieutenant Governor of Saskatchewan Tom Molloy presented the Prairieaction Foundation Youth Leadership Award to the fYrefly in Schools program for the second year in a row! Congratulations to Dr James McNinch, Suzy Yim & Kyla Christiansen for your work in promoting inclusion and acceptance. Congratulations to Paula Stoker on receiving the Bachelor of Education After Degree (BEAD) Convocation Prize, which was established to encourage and recognize the most distinguished BEAD graduate, with an overall internship rating of “Outstanding” and the highest grade point average in the program. 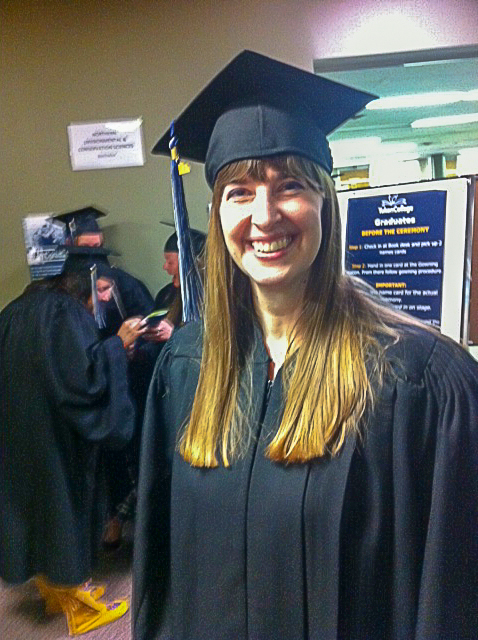 Paula graduated with a Bachelor of Education (Elementary) with Great Distinction. During her studies in the Yukon Native Teacher Education Program (YNTEP), which is offered in cooperation with Yukon College in Whitehorse, Yukon Territory, Paula was the recipient of the Academic Silver Scholarship in 2017 and was on the Dean’s List in 2016 Fall, 2017 Winter, and 2018 Winter. Born and raised in Whitehorse, Paula earned her first degree: Physical Education and Sports Studies from the University of Alberta in 1991. After following her passion for health, sports, and fitness, Paula came to the realization that she is a teacher at heart and that a classroom is where she is meant to be. Now that she has her Bachelor of Education, Paula will apply for a Yukon Teaching Certificate and looks forward to the opportunity to use her experience and education as a teacher in Whitehorse. 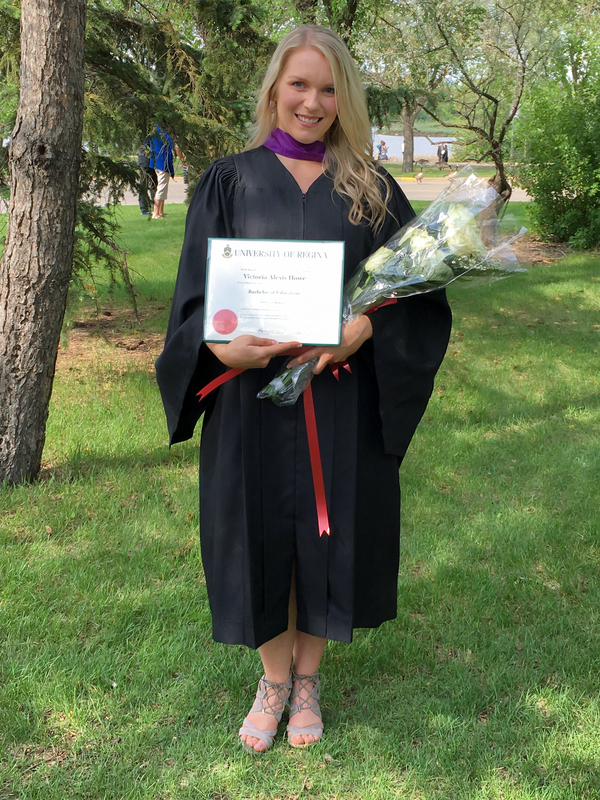 Congratulations to Victoria Howe (@MissVHowe) on receiving the Saskatchewan Teachers’ Federation (STF) Convocation Prize at the Spring 2018 Convocation. The STF prize recognizes the most distinguished Faculty of Education student, graduating with their first degree, who has an overall internship rating of “Outstanding” and the highest grade point average in the program. Victoria graduated with a Bachelor of Education in Elementary Education with Great Distinction. 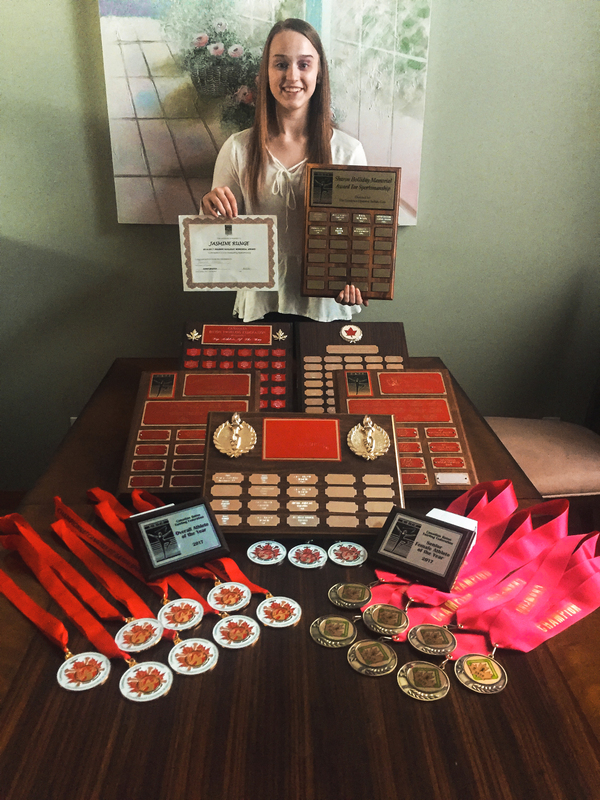 During her studies, Victoria was the recipient of the Academic Silver Prize in 2016 and 2017. She was on the Dean’s List in 2015 Fall, 2016 Winter, 2016 Fall, 2017 Winter, and 2018 Winter. Born and raised in Moose Jaw, Victoria attended Lindale and Caronport Elementary schools and graduated from Caronport High School. Next, Victoria attended the University of Alberta and studied science. However, Victoria soon decided that a career working with children would be energizing and fulfilling. So she returned to Saskatchewan to attend the University of Regina’s Elementary Education program. Victoria immensely enjoyed her three years in the Elementary program. During these years she engaged in many meaningful learning experiences, created very strong friendships, and grew greatly as an educator. Her most memorable semester was her internship where she learned just how much teachers do for their students and just how rewarding the teaching profession can be. 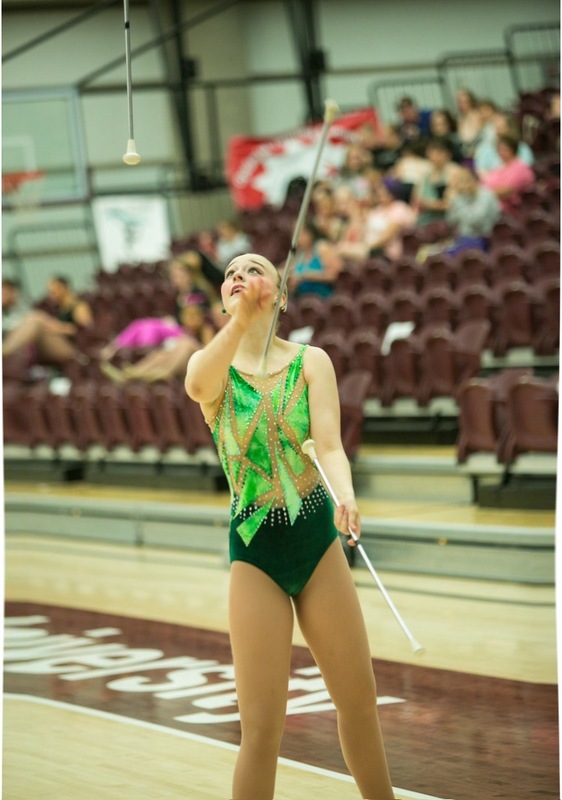 While excelling in academics, Victoria’s love for dance and performing led her to join the Roughriders Cheer team. She volunteered on this team throughout her degree and continues to do so proudly. Victoria plans to substitute teach as she works on her Inclusive Education Certificate this upcoming fall. Upon completion of that certificate, Victoria hopes to pursue her Masters in Educational Psychology and then find work near her hometown of Moose Jaw. In this wild connected world, it’s helpful to have a guide. 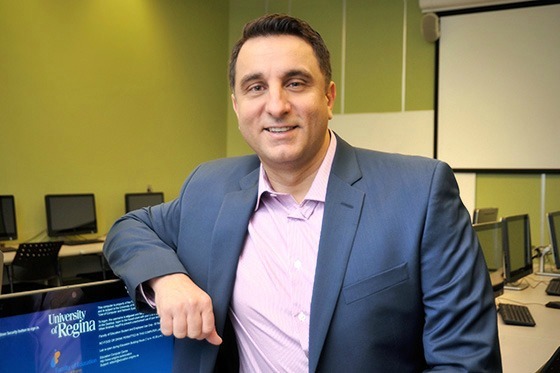 Dr. Alec Couros is guide, mentor, and technological guru for his students in the Faculty of Education at the University of Regina, as well as youth, corporations, and government ministries, as they navigate the labyrinth of digital literacies, technology integration, and digital citizenship. His innovative approach is so widely respected that he will receive the 2018 D2L Innovation Award in Teaching and Learning from the Society for Teaching and Learning in Higher Education (STLHE), a Canadian organization that strives to enhance teaching. 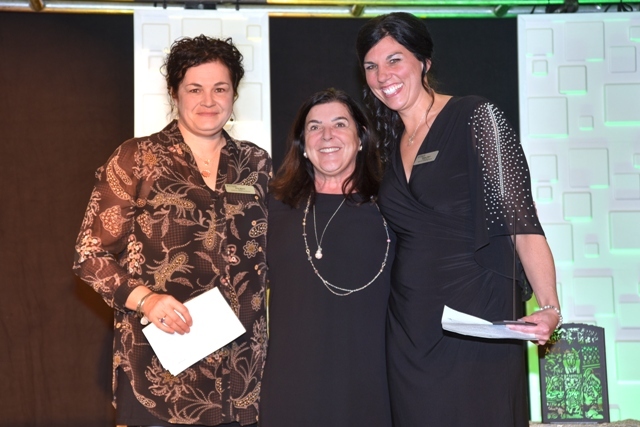 The award, to be presented on June 20 to a total of five educators across Canada during the annual STLHE conference in Sherbrooke, Québéc, recognizes those at the forefront of innovation both within their academic institutions and higher education more broadly. “These educators are demonstrating significant innovation and inspiring the future of learning. Their achievements are making learning experiences better and enabling students to excel,” said John Baker, President and CEO of D2L, an organization that promotes online learning. Couros is being recognized specifically for his innovative educational technology-facilitated student engagement assignments, including the #ETMOOC lipdub assignment where creative relationship-building occurs among 12,000 students from different countries. Couros’ students create effective personal learning networks that transcend the boundaries of the course and gain competence using a wide spectrum of educational technology tools, while establishing their online identity. 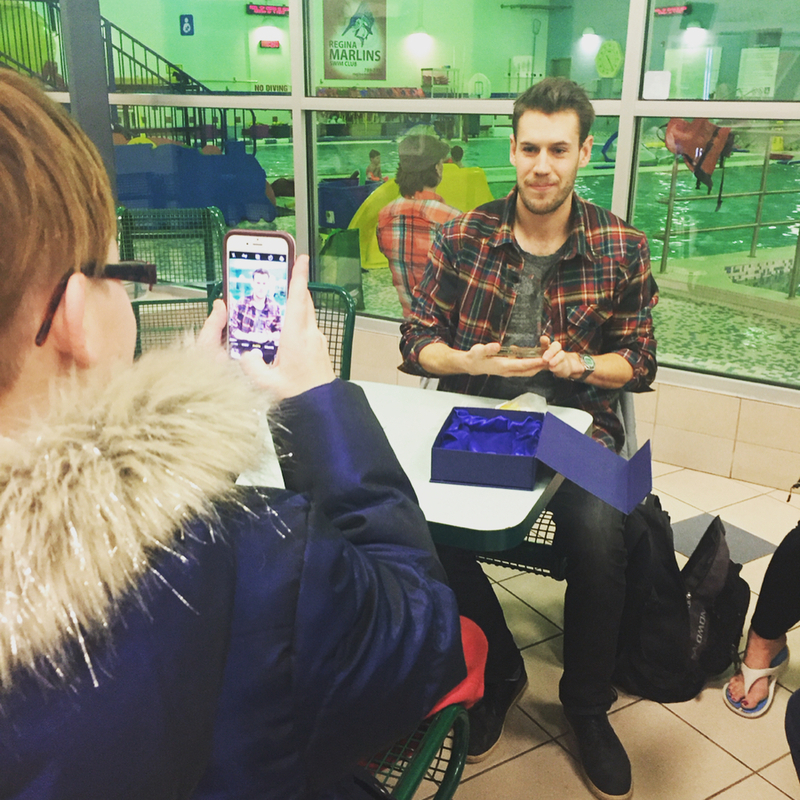 “Preparing the next generation of teachers is important work, and there are few people in Canada who do it in with the same level of innovation and enthusiasm as Dr. Couros. 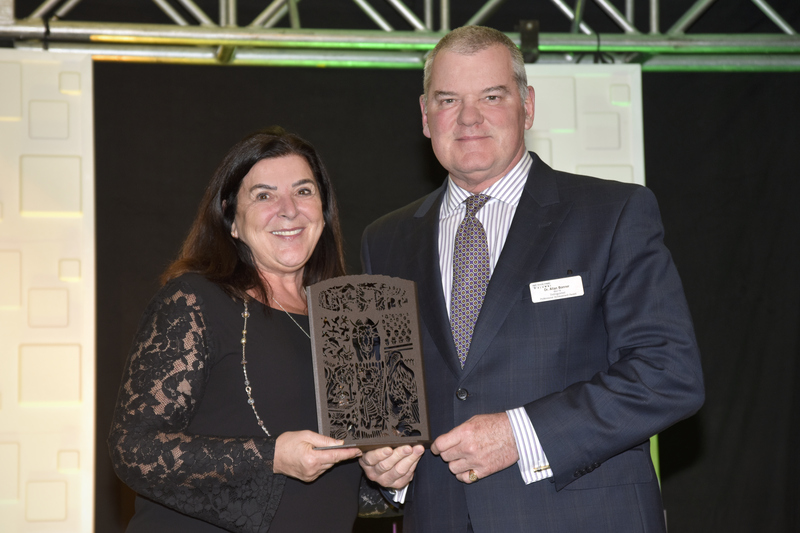 This award, which recognizes his commitment to using different technological resources and approaches to empower his students, could not be more timely or well-deserved,” says University of Regina President and Vice-Chancellor Dr. Vianne Timmons. This is the latest honour for Couros. 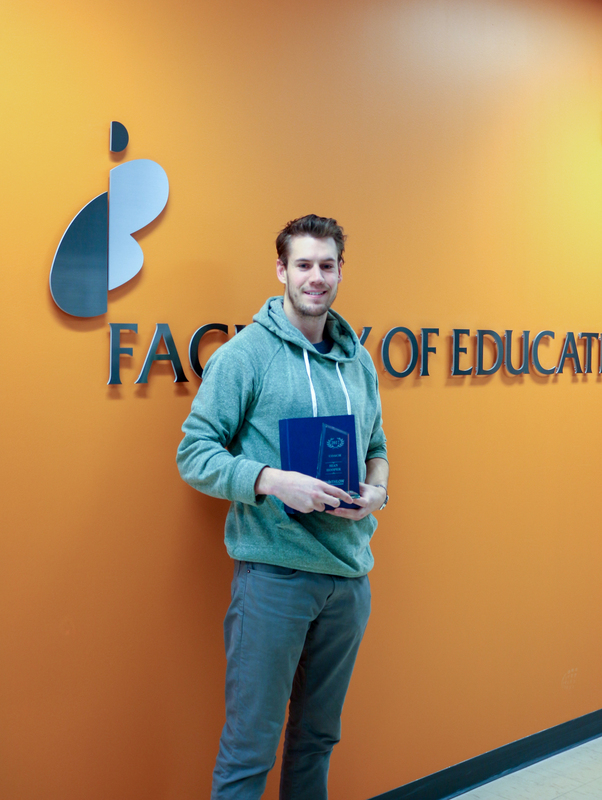 He was awarded the University of Regina Teaching Award for Excellence for Innovation in Teaching in 2015. Members of the public are welcome to attend a free presentation by Dr. Couros: Understanding scholarship in a digital world at Congress of the Humanities and Social Sciences on Sunday, May 27 from 10:30 a.m. to noon, room 228, Education Building at the U of R. Couros will outline the potential power of engaging in networked forms of scholarship and will provide participants with strategies and tools to assist academics in participating meaningfully in digital spaces. Sean Hooper, a 3rd-year Elementary Education student, was recipient of the 2017 Saskatchewan Triathlon Coach of the Year Award. 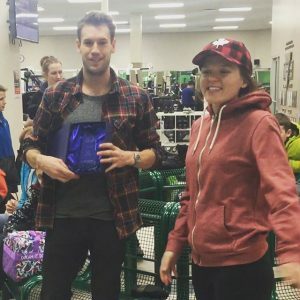 Sean Hooper, born and raised in Regina, has been coaching for six years with Regina Multisport Club’s Fundamentals, a program that he and his father started in 2012. 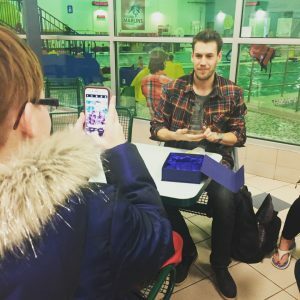 “We noticed that a lot of kids, as young as 3 or 4, had never done anything like [triathlon races] and they were turned off by the experience, or really anxious and crying,” Sean explains, “We wanted FUNdamentals to be something that would prepare kids for an event like the Icebreaker, now called the Brent Gibson Memorial Icebreaker.” And, they wanted kids to have fun at the same time. Triathlon itself incorporates cycling, swimming, and running. But Sean encourages the athletes to try other sports. “We only have practices twice a week. We are trying to move kids and parents to do multisports, such as hockey, basketball, and soccer….We have parents say, ‘my kid is really good at running,’ and they think that their child should focus on running. I say, ‘let them test the water; let them make the decision.’ That is where athletes come from; they have internal motivation,” Sean says. Coaching is what led Sean into the field of education, though he didn’t start there. “I’ve been going to University for a while. I started in the Arts, went to Kinesiology, then I took some science. After third year, I sat down to figure out what I wanted to do. What is the career I want to go to every day? Education was what I decided on. I was in Kinesiology initially because I really enjoy coaching and fitness, but I thought more about the rudimentary aspect of coaching. It was about being able to see people grow based on my teachings, and about the relationship…that was really important to me and motivated me in my coaching,” says Sean. One of Sean’s favourite sayings comes from one of his former coaches, Steve Davis, “Do no harm.” As an athlete, Sean knows that you can be hard enough on yourself, and it is not necessary for a coach to get upset because you are doing that anyways. 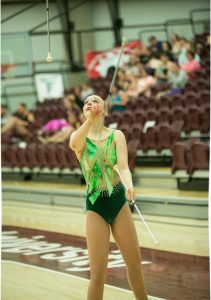 IN JUNE 2017, WHEN JASMINE RUNGE, A BATON TWIRLING ATHLETE, WAS INJURED BY HER BATON, CAUSING PERMANENT BLINDNESS IN HER LEFT EYE, SHE THOUGHT SHE WAS SEEING THE YEARS OF PRACTICE AND TRAINING GOING TO WASTE. 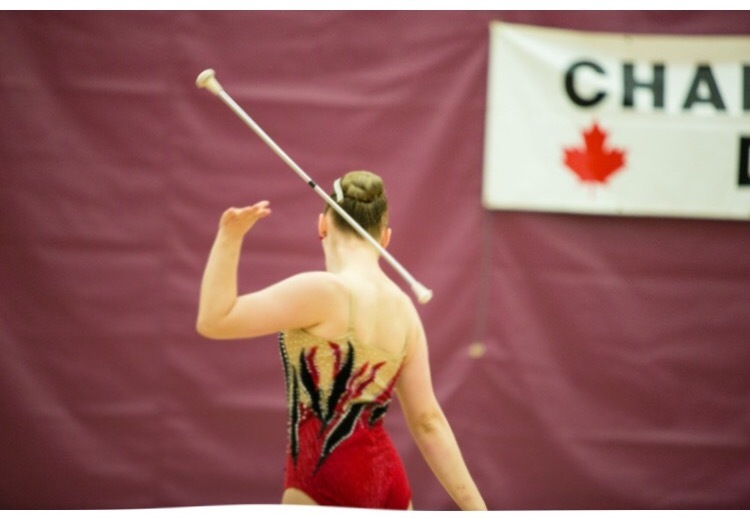 “I was definitely heartbroken; it happened at a competition and I didn’t know what to do. Usually, when I get hurt, people ask ‘Are you okay?’ and I say, ‘Yeah, I’m okay. It’s fine,’ but this was the first time I replied, ‘I’m not okay!’ So I knew it was serious in that moment and it was heartbreaking to know that I might not come back from this. Lots of people thought I was done for the year, even my coach. It was hard because I had put my whole life into baton … It always came first because that is what I loved and what I excelled at,” Jasmine says. Jasmine did compete at the International Championships despite the injury, and she brought home a Gold Medal in 3-Baton. “I got a lot of attention because I had to compete with an eye patch. My sport is all about vision! 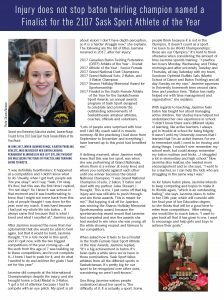 I don’t have depth perception, so it is a harder struggle now,” she explains. 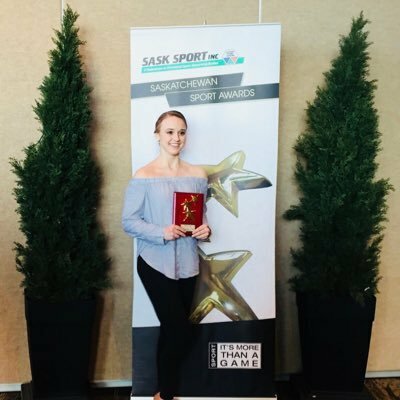 2017Finalist in the Youth-Female Athlete of the Year for the Saskatchewan Sport Awards, an annual awards program of Sask Sport designed to celebrate and promote the outstanding achievements of Saskatchewan amateur athletes,coaches, officials and volunteers. had competed and won the awards she had wanted to win since she was young, all the while showing respect and fairness to her competitors. mornings and after university Tuesday and Thursday, all day Saturday with my team, Sundown Optimist Buffalo Gals (Martin School of Dance and Baton Twirling) and all day Sunday on my own.” Jasmine squeezes in University homework time around class time and practice time. “Baton has really helped me with time management and organization,” she explains. 1. 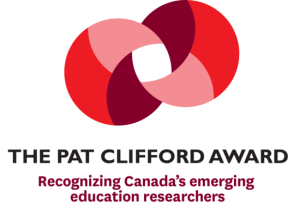 As an emerging researcher, how did you feel when you heard you were the recipient of the Pat Clifford Award? It was great to have my work around teacher professionalism recognized. Broadening understandings of the work of teachers and the valuing of teacher voice in educational policy is critically important to the future of the teaching profession and I was pleased that the awards committee placed value on that area of scholarship. 2. What commonly held assumptions do you attempt to disrupt in your research? The idea that teachers simply deliver curriculum, that a teacher stands in front of students and teaches all day. Teaching is surely the most important work they do but it’s their involvements during the regular school day in extra-classroom work that will really serve them in the work they do with students: their involvement in high quality professional learning, in mentoring other teachers, in curriculum development, and in collaborative work with their colleagues. Those experiences build professional capital and capacity to not only be better teachers themselves, but also to aid others in being better teachers. 3. What is the state of educators’ professional learning in Canada? Teacher professional learning is certainly a hot button topic in Canada, particularly in tough economic times. It’s often the first item cut from budgets since it “doesn’t directly impact the classroom” (which is so far from the truth). That being said, we have some very strong teacher federations in this country who are advocating for access to relevant and practical professional learning. Across the country, there are many innovative and exciting learning opportunities for teachers but they are not always equitable in terms of ease of access. Teachers working in the north, in rural areas, and French educators seem to have more difficulty identifying quality PL, either because of the high travel cost or the lack of qualified facilitators. 4. What is your definition of the teacher role? What practical differences will result from redefining the teacher role? For me, the work of teachers extends beyond the work they do directly with students. Teachers should also be engaged with the broader context of schooling – as leaders, as learners, as innovators, as mentors, and as collaborators. Their voices should matter in the creation of our policies and how we go about defining what is important in education. Practically, reconceptualising the work of teachers in this manner means rethinking the daily schedule for teachers. In Canada, we place the most emphasis on teaching time, which constitutes anywhere from 100% to 80% of teachers work during regular school time. This leaves little time for any of the extra-classroom work that I mentioned. In other countries, teachers spend much less time actually teaching (less than half their day in Singapore, for instance) and spend much more time working with their colleagues and participating in governance. This would be a huge paradigm shift but one that could potentially really improve education in terms of honing the skills of individual teachers while simultaneously developing the capacity of the profession to contribute to educational decision making more broadly. 5. In your own experience as an educator, what was a defining moment, when you knew that the way educational policies and the system defined your role as a teacher was inadequate for the practical realities of your role? I had just finished my Master’s and was asked by the University to come to a conference and present a paper I wrote. The school division wouldn’t grant my request for leave. It sent a clear message to me that my research and my voice didn’t matter. I decided then and there that I would spend the rest of my professional career advocating that these things did matter. 6. Was it due to your efforts that the recent name change from Educational Administration to Educational Leadership in your department came to be? Why is this an important change for our Faculty? This was an idea that had been discussed long before I came to the Faculty. I put the idea out there again and my colleagues were totally on board. Our programming has certainly evolved in response to the needs of our partners, and now conceptualizes school leadership as including, but not limited to, formal administrative roles. Informal leadership from teachers is equally important, and in many cases, is often the driving force behind educational change. We wanted to make sure the program name was inclusive of the content with which students are engaging and reflective of our belief that leadership isn’t just for school principals. 7. What has surprised you most about the findings in your research? The resiliency of teachers to continue to exert their voices and to continue to strive to be heard in the face of a mountain of challenges. Participants in my research tell me they do what they do because they know it helps them better their practice and improve teaching and learning, not only in their own classrooms, but beyond to the classrooms and schools of others. They give up their weekends and evenings, and they drive hundreds of kilometers, just to continue their learning and extend their professional networks because they consider it a professional responsibility to always be learning from and with other teachers. And yet, they also tell me they feel guilty for doing so because they are missing class time. That’s the saddest part for me: hearing the stories of guilt. If these experiences were embedded in their daily work and accepted as part of the role of teachers, perhaps they wouldn’t feel so bad? This is an area the profession certainly needs to continue to work on. 8. Has the focus of your research changed since you began your study? If so, how and why? Somewhat. In the beginning, I was specifically focused on teacher involvement in action research. 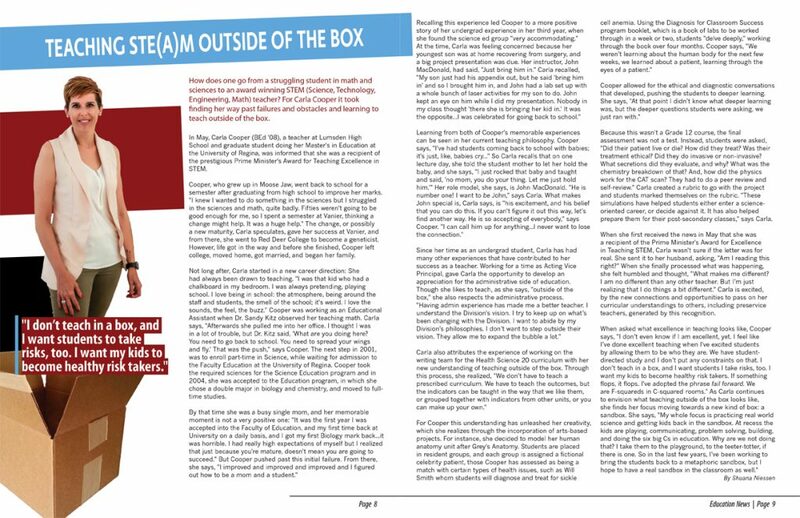 Now my work is much broader and focuses on teacher engagement in a host of extra-classroom work – I see the boundaries of the work of teachers in a much bigger way than I did 10 years ago when I started this journey. I think the teacher federations’ professional agendas are an important piece of this puzzle. They have a legal mandate to advocate for the profession and so I see their work in supporting this reconceptualization as incredibly important. This doesn’t mean strikes and traditional labour action typically associated with unions. Rather, I see advocacy as being a little more outspoken and proactive on policy issues, particularly around professional learning and other issues of professionalism, than has been the case for some federations. However, the onus also falls on current teachers to become involved in their federations, to add to that collective capacity. “Individually, we are one drop. Together, we are an ocean” (Ryunosuke Satoro).